Bisphosphonates, which have been introduced into medicine in the early 1990’s, is now being used succesfully for treatment of primary osteolitic bone diseases such as metastathic diseases, multipl myeloma, paget disease, hypercalsemia in malingnancies and management of pain occuring in these bone pathologies. Their half-life in circulation is very short, but they can stay for years in bone tissue. On the other hand, reports about bisphosphonate-related osteonecrosis of the jaw has been increasingly published recently. In this case report, bisphosphonate-related osteonecrosis of the jaw and treatment modalities has been evaluated in four cases. Sharma D, Ivanovski S, Slevin M, Hamlet S, Pop TS, Brinzaniuc K, Petku EB, Miroiu RI. Bisphosphonate- related osteonecrosis of the jaw (BRONJ): Diagnostic criteria and possible pathogenic mechanisms of an unexpected anti-angiogenic side effect. Vasc Cell 2013; 5:1. Janovska Z. Bisphosphonate-related osteonecrosis of the jaws. A severe side effect of bisphosphonate therapy. Acta Medica 2012; 55:111-115. Marx RE, Stern D. Oral and maxillofacial pathology: A rationale for treatment. 1st ed. Illinois: Quintessence Publishing, 2002. Ruggiero SL, Fantasia J, Carlson E. Bisphosphonate-related osteonecrosis of the jaw: Background and guidelines for diagnosis, staging and management. Oral Surg Oral Med Oral Pathol Oral Radiol Endod 2006;102:433-441. 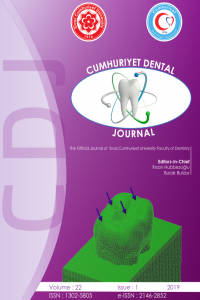 Ergün S, Güneri P, Koca H. A new threat fort he jawbones: Bisphosphonates. Cumhuriyet Dent J 2008; 11:134-139. Hoefert S, Eufinger H. Necrosis of the jaws under bisphosphonate therapy. Orthopade 2006;35:204-209. Marx RE, Sawatari Y, Fortin M, Broumand V. Bisphosphonate- induced exposed bone (osteonecrosis/ osteopetrosis) of the jaws: risk factors, recognition, prevention, and treatment. J Oral Maxillofac Surg 2005;63:1567-1575. Migliorati CA, Schubert MM, Peterson B i s p h o s p h o n a t e - a s s o c i a t e d osteonecrosis of mandibular and maxillary bone: An emerging oral complication of supportive cancer therapy. Cancer 2005;104:83-93. Kwon YD, Kim YR, Choi BJ, Lee DW, Kim DY. Oral bisphosphonate-related osteonecrosis of the jaws: Favorable outcome after bisphosphonate holiday. Quintessence Int 2009;40:277-278. Ruggiero SL, Mehrotra B, Rosenberg Osteonecrosis of the jaws associated with the use of bisphosphonates: A review of 63 cases. J Oral Maxillofac Surg 2004;62:527-534. Merigo E, Manfredi M, Meleti M, Guidotti R, Ripasarti A, Zanzucchi E, D’Aleo P, Corradi D, Corcione L, Sesenna E, Ferrari S, Poli T, Bonaninil M, Vescovi P. Bone necrosis of the jaws associated with bisphosphonate treatment: A report of twenty-nine cases. Acta Biomed 2006; 77:109-117. Yarom N, Yahalom R, Shoshani Y, Hamed W, Regev E, Elad S. Osteonecrosis of the jaw induced by orally administered bisphosphonates: incidence, clinical features, predisposing factors and treatment outcome. Osteoporos Int 2007;18:1363-1370. Freiberger JJ, Padilla-Burgos R, Mcgraw T, Suliman HB, Kraft KH, Stolp BW, Moon RE; Piantadosi CA. What is the role of hyperbaric oxygen in the management of bisphosphonate- related osteonecrosis of the jaw: A randomized controlled trial of hyperbaric oxygen as an adjunct to surgery and antibiotics. J Oral Maxillofac Surg 2012; 70:1573-1583. Ruggiero SL, Dodson TB, Assael LA, Landesberg R, Marx RE, Mehrotra B. American Association of Oral and Maxillofacial Surgeons position paper on bisphosphonate-related osteonecrosis of the jaws-2009 update. J Oral Maxillofac Surg 2009;67:2-12. Agrillo A, Filiaci F, Ramieri V, Riccardi E, Quarato D, Rinna C, Gennaro P, Cascino F, Mitro V, Ungani C. Bisphosphonate- related osteonecrosis of the jaw (BRONJ): 5 year experience in the treatment of 131 cases with ozone therapy. Eur Rev Med Pharmacol Sci 2012; 16:1741-1747. Ripamonti CL, Cislaghi E, Mariani L, Maniezzo M. Efficacy and safety of medical ozone (O) delivered in 3 oil suspension applications fort he treatment of osteonecrosis of the jaw in patients with bone metastases treated with bisphosphonates: Preliminary results of a phase I-II study. Oral Oncol 2011; 47:185-190. Atalay B, Yalcın S, Emes Y, Aktas I, Aybar B, İssever H, Mandel NM, Cetin O, Oncu B. Bisphosphonate- related osteonecrosis. Laser-assisted surgical treatment or conventional surgery? Lasers Med Sci 2011; 26:815-823. Scoletta M, Arduino PG, Reggio L, Dalmasso P, Mozzati M. Effect of low-level laser irradiation on bisphosphonate-induced osteonecrosis of the jaws: preliminary results of a prospective study. Photomed Laser Surg 2010; 28:179-184. How to cite this article: Emre Dikicier, Ümit Karaçaylı. Surgical management in patients with bisphosphonate-related osteonecrosis of the jaw: four cases. Cumhuriyet Dent J 2014;17(Supp 1):16-20.